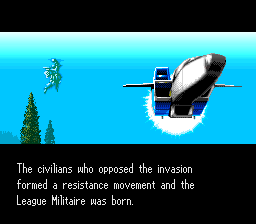 After all this you might be wondering why I would even bother going through the trouble of hacking the game and finding a translator for it. Well, back when I first started, I thought about working on this game but didn't understand things well enough to do it at the time. 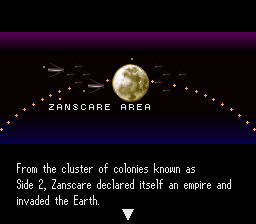 In retrospect, this is a really simple, straight forward game to hack. Flash forward a couple years and I decided to take another whack at it and use it as a stepping stone for learning the ins and outs of the SNES. So during the summer of last year (2005), I sat down and managed to shrink the font down from the 16x16 font used in the Japanese version to a more English friendly 8x16. Over the next couple of months, there were a couple of translators who signed on to help, but then disappeared. Then in March (of 2006), the clouds parted and the lights shined through. Suzaku (a fellow Gundam fan) signed on board and worked on translating the game's script over the next 7 months or so. When he finally completed it earlier this month (October '06), he suggested the script could be a lot better if it weren't for the space (on-screen; space in the ROM wasn't a problem) restrictions. 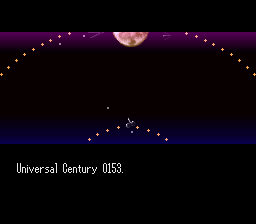 I mentioned a variable width font would probably help and set out to implement one. Seeing as how it was the first (and probably the only stock ASM translation "tricks" I hadn't done), I didn't exactly know where to start. Luckily, Gideon Zhi of Aeon Genesis fame was kind enough to let me take a look at his source code for his Rudra patch, which was more than enough for me to figure out how to do it. With the VWF in, Suzaku and I sat down and stepped through every single string and meticulous revised the script. In some cases we were even forced to add filler to pad the text out to avoid having a string break amongst 6 word sentence. 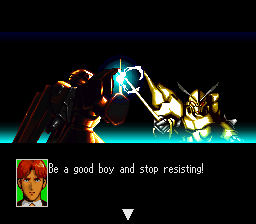 In the end, I feel that despite the "lite" nature of the game's script, it is really worth reading. 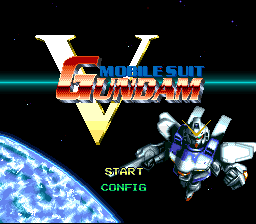 Some time during all of this, I approached Kitsune_Sniper of Vice Translations to design a title screen in the same vein as the official English title screen. Once he had the design finished, I asked Ryusui of Watercrown Productions (*SYLVANIANS*), having seen how accurately he had reproduced the color scheme for his Sylvanian Families 4 translation, if he would care to take a whack at V Gundam. 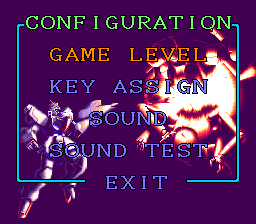 The end result is quite possibly my favorite title screen ever. If you have no other reason to play the game, play it just to see the title screen. It's that good. Everything is translated and thoroughly tested. That doesn't mean that there aren't still bugs lurking around, just that we didn't find them. If you find any read drop me an email about it. I'm actually very, very pleased with the patch. When I started working on it, I wasn't really excited about it, and now I want to tell everyone about it, despite the cardboard like gameplay. I think I mentioned everyone who contributed to this project, but I'd just like to thank everyone who did. This wouldn't be even half as good as it is without you. Ultimately, I hope you enjoy this patch. 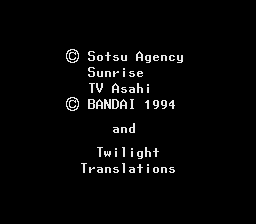 Check back with Twilight Translations for future releases! Cheers!